One of the easiest propagation techniques is propagating using hardwood cuttings. Since these cuttings don’t have leaves, there isn’t the initial requirement to provide a high humidity environment to stop the cuttings drying out before they root. I’ve discussed the basic theory of how plants can be propagated from cuttings in the article "Propagating Herbaceous Plants from Cuttings", so I’ll go straight into practical instructions here. Hardwood cuttings are even simpler to prepare than herbaceous cuttings, as we use cuttings from dormant deciduous trees and woody plants, and this technique is very useful for propagating fruit trees such as figs, pomegranates, mulberries and quince. Some plums can grow well from hardwood cuttings too, while other’s don’t do so well, it depends on the variety. This technique is also used for propagating vines such as grapes and kiwi fruit, and the currant family – blackcurrants, redcurrants, golden currants and gooseberries. Hardwood cuttings are taken from deciduous trees and plants (ones that lose their leaves in winter) when they are dormant, i.e. when they have no leaves. The best time for taking hardwood cuttings is from early autumn when the leaves drop to late winter. Take cuttings that are close to pencil-thickness from current season’s growth – it will be mature and woody, not soft and green. Cut off any unripened green growth at the tips. Try to take cuttings where the current season’s wood (1 year old wood) joins the two year old wood. The base of the stem at this junction has the greatest potential for root development – it contains a large number of dormant buds that supply hormones required for developing roots. Take cuttings at leaf fall and just before the buds break. Hardwood cuttings are cut much longer than herbaceous cuttings because they take more time to develop roots and therefore need to use the reserves of food stored in the cutting to keep them alive through winter. A longer cutting stores more food in it. Make a horizontal cut 6mm (1/4”) below the lowest bud at the base. 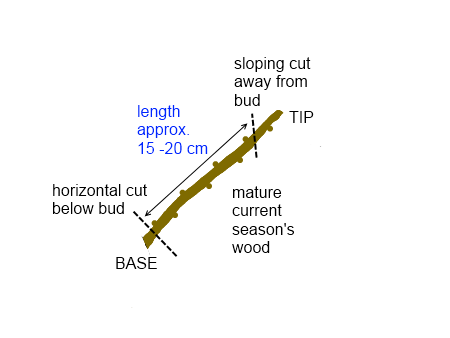 Find a bud approximately 15-20cm (6-10”) away from the base to make the tip cut. Near this tip bud, make a sloping cut away from a bud, 6mm (1/4”) above the bud. Species difficult to root should be “wounded” as this helps encourage rooting. This involves making an additional light cut on either side of the cut stem at the base to expose more of the cambium. 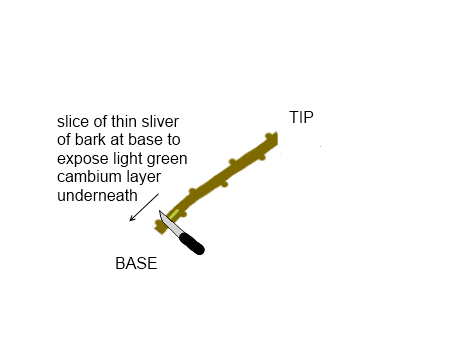 The cambium is the light green layer you see under bark when you scrape it away, before you get to the wood, this is a single layer of meristem tissue. Wounding also helps in some cases to remove a physical barrier which may be getting in the way of roots forming. You can scrape off the bark or outer layer to expose the cambium using a knife of the sharp edge of your scissors or secateurs. Treating cuttings with rooting hormone can increase the chances of stimulating root growth. This is more critical in plants that are more difficult to root. Simply dip the base into the rooting hormone, that’s all! If using root hormone powder, and be sure to tap the cuttings to remove excess powder. The cuttings can either be placed in the ground in a ‘slit trench’ outside, or they can be placed in a container of propagating medium. The cuttings can still lose moisture and dry out, even without leaves, so we try to place as much of the cutting below the surface of the soil, while allowing top 3 buds at the tip to be sitting above the soil level. Leaving 1/4 to 1/3 of the tip of the cutting above the surface achieves this, otherwise just leave three buds unburied. 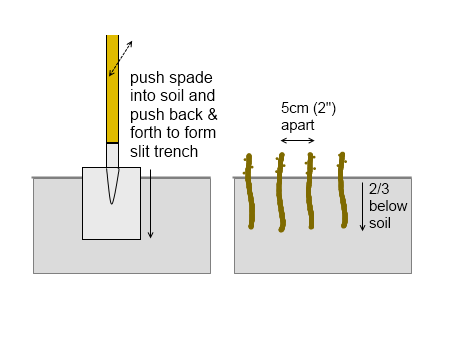 Make a ‘slit trench’ by pushing a spade into soil and rocking it back and forth. In clay soil, add some coarse sand for drainage. Put cuttings in so 2/3 is below the soil, place cuttings 5cm (2”) apart and press the soil down around them. If using multiple rows of slit trenches, place rows 30cm (12”) apart. Water in the soil around the cuttings. The soil will remain damp over the winter period. Cuttings will root and be ready to plant next autumn. Fill a container (pot) with a suitable propagating medium. Materials commonly used as propagating medium are coarse sand, regular potting mix, coconut coir, or blends such as a mixture of one part peat and one part Perlite (by volume), or one part peat and one part sand (by volume). Put cuttings in so 2/3 is below the soil, place cuttings 5cm (2”) apart and press the propagating medium down around them. Water in the soil around the cuttings. Keep the propagating medium slightly damp but do not overwater as this will cause the cuttings to rot. If possible, place the container in a cold frame of greenhouse to speed up the formation of roots. The cuttings will be ready to transplant in spring. Grape vines have a slightly different technique for hardwood propagation, so I will detail it here. To propagate grape vines, simply take a cutting with 3-4 buds, and push into the propagating medium so that only two buds are unburied. You can also take very short cuttings containing only one bud known as “vine eyes”. Make a cut 6mm (1/4”) above a bud, then make another cut 5cm (2”) below it to complete the cutting. 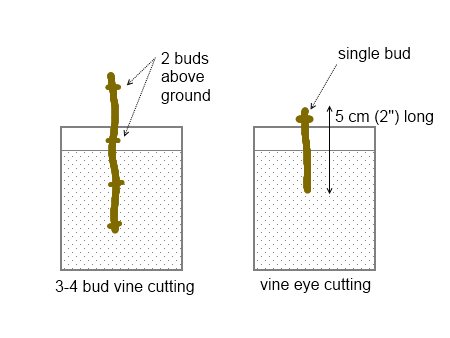 Note: vine eye cuttings with their single bud only do not take root as easily as the larger 3-4 bud cuttings. You can put many vine cuttings into a single container, and then pot them up separately when thy put their leaves out in spring. It is advisable to let them grow in their pots for a year to develop strong roots, then they can be transplanted in the following spring. As you can see, this technique is very simple, and you can use all the cuttings left over from the winter pruning of fruit trees to propagate more trees. Its better than tossing out, mulching or composting the prunings, and if the cuttings fail, then you can do that. At best, you’ll end up with more trees to plant in your garden, or to give away to others. Simply because these cuttings, being of different levels of maturity, taken in different of the seasons, have the greatest potential for root development at these times. So Here is my attempt to explain, hope it helps, with deciduous trees, as the seasons change to colder temp. the sap moving inside the xylem or sap wood, begins to slow down, this process acts as an anti freeze for the plant, when the season begins to warm the sap begins to rise and move through the plant again, awakening it to another season of growth. With many(most) hardwood cuttings, have to go through a process known as callusing. This process sends concentrations of hormones to the callus, those collections of hormones result in the bud meristems ability to differenciate between growing roots or shoots(leaves,branches.) If hardwood cuttings do not callus over before being exposed to consistent moisture, mostly you end up with rotten cuttings. Also using the right medium helps water content in the soil. Herbaceous or green wood cuttings are different, because sugars move freely for the entire season, the plants ability to differenciate hormones to growth meristems is easily obtained, and there is not as much of a need for excess storage of food because there is no dormant period, or in the case of some perennials, they may die back to the ground but they have some sort of enlarged root system like kudzu for example. Thry store just enough food to keep the roots healthy and to shoot up the first groeth when the soil warms. With these perennials i have found it easy to propagate with root cuttings or division. Even in mid summer ive propagated milkweeds and perennial sunflowers from root cuttings, just plant and keep semi moist until you see growth, let the soil dry but not completely before giving it some water, ive found it best to do them in indirect sunlight or even shade when its reallllly hot. In most cases of herbaceous cuttings ive taken them anytime during the growing season, reduce the amount of leaves by 2/3 and keep moist in shady area until you see new growth. Hard wood cuttings are best for deciduous plants or trees because they are in a state of rest, by the time they callus over and form roots, they then can get the energy to produce leaves, and then ultimately grow a larger stronger root system. sometimes ive had hardwood cuttings send out a set of leaves, so they can photosynthesize to grow roots, mostly ive experienced them rooting in, and in warmth they send out leaves and begin growth. I have also done softwood cuttings for deciduous trees and shrubs, that is a very effective way to propagate, however the attention required is more intensive vs hardwood cuttings whoch require a lot less care in most cases. One last thing.. another way o have seen hardwood cuttings done is by air layering or even taking a one gallon plastic pot or 2 liter bottle and cutting a slit, slide it on the branch and fill it with soil, in the spring keep it moist and once rooted in the container cut it from the main plant. Hope that helps! I want to get roots on Pecan wood. What will you suggest? You can propagate pecan trees (Carya illinoensis) from cuttings, but they’re propagated using softwood cuttings with leaves in late spring to early summer when the tree is no longer dormant and actively growing. See the article Propagating Softwood Cuttings for step by step instructions on how to do this. Very nice instruction. I’ ll be pruning my 2nd year grape vine tomorrow. Will also be propagating a few vines, which i hope does leaf. Thanks for the confidence 🙂 those illustrations are very nice and helpful. This is very good information, I wish I had found it 2 weeks ago when I tried some ponds seedling plum cuttings in pots. Looks like I have over much cutting left above the soil – about two thirds. Anyone know if it will be helpful at this stage to cut them down? They were 30cm long to start with. I think I can do this without disturbing the bases of the cuttings. Also, I have them in an unheated greenhouse but this is unshaded and gets very hot in the sun – would they be better placed in a shadier location under a cold frame or cloche? You can cut down the cuttings if you want as long as there are a few buds still left above the ground where leaves will emerge. If they are in a greenhouse, the humidity should support the longer cuttings. Try cutting some down, and leaving others the same length, you’ll see which works better that way. All greenhouses should be shaded on very hot days otherwise you’ll cook everything inside, drape some shadecloth over the roof and sun facing walls! A shaded greenhouse is desirable, but failing that you could use a coldframe to speed up the root formation. Thanks for this. I have cut some down. It might not be to late to try some more following all the advice provided. Unfortunately the greenhouse is to big to shade easily so I will have to be on the ball with the ventilation on sunny days. I might transfer them to a cold frame when the weather warms up. No worries about the greenhouse getting overheated in the last few weeks! This is to report that all my greenhouse cuttings have come into bud. I put them low down in a shaded area. The ones that I left ‘long’ came into bud earlier than the ones I cut down to just 3 buds showing. I am very concerned about watering. My 50/50 peat/sand mix seemed to remain damp constantly and I understand that the cuttings should not be in a wet medium. I don’t want to over water, but I feel sure that there must be some drying out on the warm days in the greenhouse. With this in mind I give them the occasional dribble of water. I hope I am doing the right thing. I have mine in pots in my basement. There are grow lights there, but not right above the cuttings. I put stakes in and then wrapped plastic around. I mist the inside of the plastic every few days. Water about 2 to 3 times a week. ALL have put out leaves in the past week. Once cuttings have roots and put on some growth, it’s time to pot them up in a proper potting medium to provide nutrients, and then they’re placed in a protected environment to harden off a little and grow further. If I start a Yuca hardwood cutting in the greenhouse on March 1 what is the earliest date on which I can transplant? They’re just like any other plant propagated by hardwood cuttings! Oak trees cannot and are propagated from seed, plant the acorns! To do all my Silver Leaf Maple Trees, I did about 40, as I sell them, I merely collected the little helicopters that flew off them and landed on the ground and they grew perfectly. Did not cover just layed them on top of soil and they rooted. I have a question. if a bud that is below the soil line on a hardwood cutting (buried in the dirt) breaks, will this become a root? thanks. I know that callus is supposed to form in order to get roots, but I have some cuttings that the buds below ground break and they send out a whitish shoot, just wondering if these will become roots? Based on your experience,can you list down what plants is difficult to propagate? It’s easier to list the ones that do propagate easier instead! I prefer to do my research first and check whether plants can be propagated, by which methods, and what conditions they require for successful striking. Much easier than spending months waiting or trial and error. You might not be able to get hold of a misting propagator or gibberellic acid, but if you keep the humidity up around the cuttings, you won’t need a intermittent misting system. The gibberellic acid is used to force the buds to open and put out new leaves, this forces the cuttings to establish early to prevent them dying over the winter. Worth a try to see what happens! I am planning to propagate Barbados cherry and Pomegranates. What is the best time to do it ,since these are evergreens and wont drop their leaves or go dormant? I want to propagate a 200 year old black gum tree. Are there any special requirements to propagate it from a cutting? Should this also be done in the fall? I’m going to have to shoot the branches out of the tree to propagate because they are too tall to reach. Please advise me if I could propagate a Melaleuca Paper-Bark tree from a cutting. I’m informed that Australian trees are very difficult to propagate. I just love the look of these trees! Are currants a hardwood? They certain ‘feel’ hard but Im unsure – how would the be propagated? can you use this method on a baobab branch? Yes Baobab trees can be propagated from cuttings and from seeds. Can a Japanese maple be propagated? Would it be done at the same time as other hardwoods? Most Japanese maples cannot be propagated from cuttings, and if the cuttings do grow roots, they are usually weak and can fail soon afterwards, which is why the primary method of propagating Japanese maples is by grafting seedling plants with scion wood from a known variety. Japanese maples can be grown from seed but the seedlings won’t necessarily be the same as parent plant because Japanese maples are openly pollinated, which means they’re pollinated by insects, birds or are wind pollinated, which introduces genetic variation in the seedlings. I have a question about rooting Confederate Roses. When I rooted them in water, they produced nice roots; however, when I potted them up, the roots did not survive. What can I do differently to be able to root them in water? If you root cuttings in water and then put them into the ground, the sudden change from lots of water to very little causes the failure. Such cuttings need to be potted up into a small pot that has a fairly moist potting medium, and then you can gradually let the cuttings adapt to a mix that is dryer by gradually watering less often. Eventually, they will be able to survive in a pot or in the ground. It’s important to pot up the cuttings and let them develop a nice strong root ball over several months, don’t be in a hurry to plant them out! Hi, I have had poor success with propagating wine grape cuttings. I took about 300 cuttings off healthy vines in autumn after the leaves had fallen and moistened and wrapped in paper and put in fridge during winter at 1-2 degrees C. I potted these cuttings in individual pots in a good quality potting mix following applying rooting hormone beginning of summer and have only had about 20% success after 2 months. During this 2 months they have been watered and keep out of direct sunlight. I have subsequently planted all cutting in the ground which was well prepared and has drip irrigation. Still poor results. Since I am establishing a small hobby vineyard I need to re plan what I do next. Any hints of what might have gone wrong. Take cuttings in winter and plant straight into propagating mix in a pot, in a protected space that gets only morning sun, don’t put them in the fridge. Grapes propagate exceedingly easy, which is why you can strike them from “vine eye” cuttings that have a single bud. Hello, we’ll be pruning our apple tree this year. It’s a wild apple tree we happen to have on our land and the apples are simply the best apple I’ve ever had and moreover, it seems to resist bugs and larva quite well! If I understand right, this method works on trees? (I’m sorry, English is not my first language so sometime I need to ask more questions to be sure ahah) For apple trees, am I better using root activating stuff like the Willow Water mentionned in another article? I want to take cuttings from wisteria I am in central Ontario. I thought if I got the cuttings started early and well established they would have a better chance of making it through the winter. Is it possible to have 10” cuttings start to root when it is -10%C if I bring them into the heat and humidity of a inside green house, I plan on putting them into water until they start to root or should I put them into something else? I have sea-buckthorn cuttings in a small green house in water they have started putting up leaves but no roots yet, what chance do I have of any of them actually setting root? Wisteria can be propagated using hardwood cuttings in winter, it is a deciduous vine so it will be dormant in winter anyway, so the winter shouldn’t make a difference – take your cuttings late winter. You can also propagate wisteria by using softwood cuttings anytime from spring through to the middle of summer, but they’ll have leaves at this time so treat them as herbaceous cuttings. Thanks for this very helpful article. I followed the instructions on some black currant, box elder (AKA Manitoba maple), chokecherry, and red osier dogwood. I took them all when they were dormant here in March and planted them in propagating medium just now. Do you think I will be able to put them in the ground in fall (late September)? If so, do I need to remove the roots from the propagating medium, or can I just place the containers in the soil (containers are the plant-able kind)? If the roots are strong enough and they have put on good growth during spring and summer you can plant them in the ground in autumn. Also, if you’re using plantable pots, just plant straight into the ground, that’s the beauty of using the commercial plantable coconut coir fibre pots or homemade newspaper pots, they minimise root disturbance and break down in the soil. if cuttings of hot climate (low land) are introduced in cold climate (high land), the time of sprouting increase considerably to the place originate. if you compare the rate of spout, for the species called Osyris lanceolata which prefer low land or hot climate, you find that there is a significance difference on their sprout percentage. so that why during cutting propagation, ecological condition also play the role for the practice to be successful. Thank you this is very helpful. I will take a few more cuttings just to make sure it is now April 1, should they be kept warm 70/75% or 45/60%. These are cuttings from wisteria and they are dormant. Question from tjoneal some time ago higher above asked if buried buds become roots besides calluses. I thought one must prepare length of cutting to include for buried bud because its essential ingredient for producing roots. My question would be opposite. Can one make a cutting which only includes above unburied buds, and insert mechanically damaged bud less portion in medium? Does root production come from Phloem callas, buried bud, or both? Even like cut edge of phloem being point of stump shoot production. Most importantly, since cutting produces “Advantageous” roots paralleling trunk overmulched conditions or branch falls in forest taking root. 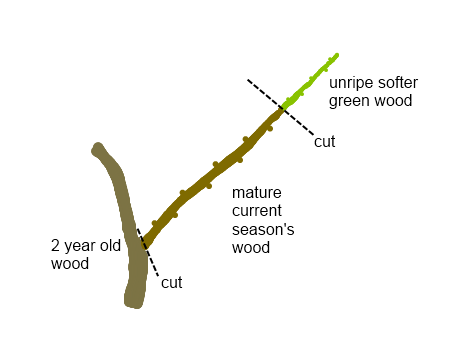 How essential would next step be for healthy survival of very long lived hardwood tree (Like Green & White Ash having 300 & 6OO yr. lifespans) by utilizing root stock 4 grafting cutting instead because it is already producing root phloem type tissue below soil line, compared to above ground grown branch cutting maturing with bark production below ground. I know wet buried in mulch trunk which is above ground portion of stem produces Advantageous Girdling growth then inevitably failing by allowing entry to outside attackers. And if cuttings root production is advantageous which wander directionless rather than a driving force like normal root ball growth which radially extend outward. Will cuttings roots need selection and redirection by human when transplanted, which will set their roots proper direction for life? Will hormones change tissue growth for surviving below soil conditions? Last, do Epicormic fast grown emergency sucker shoot growth cuttings lose their unwanted traits and revert back to regular branch production characteristics involving apical regulated hormones as well? Should trunk shoot selection grown from dormant bud reawaken for this method be discouraged? One can identify maturing Coppice grown trees also produced as emergency shoots from original organisms surviving root system by unique trunk roles in heightening bark. I apologies for dictated list of detailed questions written like a fourth grader. Forgot can’t post and then edit like normally do. Otherwise would have proof read whole lengthy thing down. Answers for one or two big questions I had above would be plenty. Thanks 4 keeping Blog fresh with answers. I want to try to propagate an oak tree in my yard. Is there any way to do so now (in April) or must this be done in fall or winter? I live in Ohio, so the weather is still fairly fall-like. Angelo, on maturing trees produced from rooting hardwood cuttings, how does buttress root development and anchorage compare to regularally grown trees? If cuttings roots are Advantageous, are they more susceptible to girdling host stem instead of growing radially outward? Will stem tissue portion inserted underground for rooting ever change over to producing root tissue and vented bark instead for continued survival? (This might not even be an issue since only small portion of stem remains below soil.) So with observed differences, can a root cutting hope to achieve species same possible lifespan, or prone to unique problems? I have heard grafted examples perform better than root cuttings regarding fruiting trees, and type of species effects individuals success rate also… Is at least one buried bud (And its hormone production) required for root growth, or can a root be individually produced from mechanically damaged portion, like stem cut or sliced open Cambium? (such as “Budless” stump shoot production or limb topping causing water sprouts). Is ancient Air layering process rooting limbs still attached to tree a better option for Hardwood organisms long time survival? I have yet to uncover any past research results on this subject. Your technical answers could assist me in deciding what is better method to utilize when attempting to preserve individual historic trees, which should live out a century or more without becoming a public safety issue. arrivederla…. Wow, lots of questions! I’ll do my best! > Angelo, on maturing trees produced from rooting hardwood cuttings, how does buttress root development and anchorage compare to regularly grown trees? Not sure, I’ve never grown extremely large shade trees from cuttings and grown them to maturity. > If cuttings roots are Advantageous, are they more susceptible to girdling host stem instead of growing radially outward? I think you mean adventitious roots (ones that form from shoot tissues, rather than from another root). These would grow normally just like any other roots, as many fruit trees are cutting grown, figs, mulberries and pomegranates come to mind, and the former two grow to very large trees. > Will stem tissue portion inserted underground for rooting ever change over to producing root tissue and vented bark instead for continued survival? (This might not even be an issue since only small portion of stem remains below soil.) So with observed differences, can a root cutting hope to achieve species same possible lifespan, or prone to unique problems? Trees are capable of regulating themselves relative to their environment. Think about how stem layering works for propagation purposes. The portion of a cutting below the ground should stay that way and be planted at the same level when the cutting forms roots. Grafting gives the benefit of attaching different roots to a plant to enable it to grow in soils where it normally can’t grow, so if you’re planting a tree where it shouldn’t be planted naturally, it will have a shorter life. Grafted trees don’t live as long as seed grown trees, but both have naturally formed roots. Cuttings grown plants typically have a weaker root system than seedlings or grafted trees, but dwarf trees intentionally have weaker varieties of root systems which they’re grafted onto, which is what makes them dwarf trees. If the tree has a deep taproot, this is something that will only be present in a seedling root (and on a grafted rootstock). Tree cuttings don’t develop tap roots, as this is a structure that forms at the seedling stage. > Is at least one buried bud (And its hormone production) required for root growth, or can a root be individually produced from mechanically damaged portion, like stem cut or sliced open Cambium? (such as “Budless” stump shoot production or limb topping causing water sprouts). The locations near the nodes where buds form are chosen simply because there us more actively growing meristem tissue there which differentiates into various cell types. > Is ancient Air layering process rooting limbs still attached to tree a better option for Hardwood organisms long time survival? I have yet to uncover any past research results on this subject. There is no difference between a plant produced by air layering cutting, which is also a cutting technically, and any other cutting grown plant, air layering is often used to root cuttings that are difficult to root by other methods. > Your technical answers could assist me in deciding what is better method to utilize when attempting to preserve individual historic trees, which should live out a century or more without becoming a public safety issue. arrivederla…. I hope this information proves useful. I would also recommend contacting production nurseries that supply these trees to see what method they use to grow them, you might have to use grafting or even propagation from seed. Mr. A. Your concisely detailed answers fit like matching puzzle pieces to the set of technical questions I put forth above. Angelo you have made it confidently clear that grafting onto root stock is the most proven way to go, based on traditional & modern methods. I look forward to learning much more through your tree nursery experience recommendation very soon since I just met someone who can get me in up close to facility operations! One thing already learned is how important orientating replanted tree’s graft union from direct sunlight is because of it’s fragile bark. And just found 2 pkwy examples damaged in this manor. Regarding early taproot development, I recall how Oaks and even most trees need this stage to produce outbound lateral roots with. So root stock method is like mating a bulletproof Ford rear axle with Chevy power plant, ha…Wow, Dwarf tree’s regulated stem growth thru limiting root stock types utilized, Cool! Ironically today most trees sold are all grafted clones, which makes people think that bulbous point is true “Root flare”. Then dangerously bury the real one below soil and mulch. I Have witnessed both pictured and up close Individuals of healthy safe and long lived grafted 2 stock examples. Some well known maturing century old oddities produce exaggerated differences between their trunk circumference, along with clash of bark textures. Thanks for taking time to be thorough here and throughout your blog, passionately educating horticulturists across the world. Enjoy! You would use a bud graft, also known as a shield graft or T-graft. Hi Maria, early spring is the right time to bud graft a citrus. A bud graft is also known as a T-graft or shield graft, you don’t need much material as you only need a single bud, you aren’t grafting a whole piece of scion wood. Hi Angelo, can I cut and propagate clematis, put them in soil and sand and keep them on my back patio covered with plastic for winter till spring? Does a longer cutting with a big part of stem burried under the ground produce a better root system than a shorter cutting? No, not really, it depends on the plant. Very few plants will grow from long cuttings, and the problem with long cuttings is that it’s harder to keep them covered to maintain humidity, and they’ll have a lot more leaves, which may appear before the roots, drying the cutting out more easily. thank you for this information! i am hoping to use this method to make a transplant from which i want to grow a bonsai. only problem is i need to start off with a small cutting and pot. if i have 3-4 inches of the cutting under the soil, this would require too large a pot for a bonsai. once it roots, can we then cut off some of the top of the cutting? any other advice for how to use this method to create a bonsai version of my plant? thanks! I’ve grown bonsai for many years before I had to give it up due to lack of time! – Propagate your cuttings so you have a plant to begin with. – Grow and train your plant in a BIG pot for as long as it takes to get the shape you want – this is a PRE-BONSAI and your plant can spend a few years in this form. – When your plant is ready to pot up into a bonsai pot, prune roots and top as per standard seasonal bonsai maintenance regime. It makes no difference whether you’re propagating a tree to grow as a shade tree to sit under, or as a tiny bonsai, it all starts off the same way! I also want to try and grow a cutting to Bonsai. Can a large 2-3″ thick cutting be rooted? And should I cut back to focus energy in making roots grow or should I not cut back the limbs until an extensive root system is established. Also it will be a crepe myrtle I am experimenting with. Thanks in advance. Can a large 2-3″ thick cutting be rooted? If it’s a willow tree. Some trees can most can’t. No shortcuts to bonsai, it takes time to grow a thick trunk and branching structure, otherwise every bonsai enthusiast will be creating ‘instant bonsai’! Hi Tom, no you don’t need to scar the bark of the grape vine cuttings below the soil or use rooting hormone, grapes take quite easily, but you can if you like! Hi Tom, that is a “how long is a piece of string” question – there are far too many variables here, depend on the plant species, the time of year, your climate, the location where you have your cuttings, the humidity levels in the air, the temperature of the propagating medium, whether you use rooting hormone or bottom heat… Basically, they’re ready to grow roots when Nature decides they are, it can be anything from a few week to months. You are really helpful for many people. So I have my question as well. Hardwood leeafless cuttings around 10cms long, wooding and rooting hormone. I plant them in peat plugs in a container under which there is a heating pad at 24C. Do I need to keep them under a chamber to keep high humidity? Does UV light help? How can I control fungus? Thank you alot. Greetings from France. Correction > Hardwood leafless citrus cuttings around 10cms long, wouding and deeping in gel rooting hormone. Propagate citrus by using air layering, citrus will not root from cuttings. Hardwood cuttings are for deciduous plants and trees (these lose their leaves in winter), citrus is an evergreen tree. The air layering will work but be sure that the citrus can cope with the soil types in your area, otherwise grow a seedling from seed of a type of citrus that grows well where you are and bud-graft the seedling with your preferred citrus type in early spring using a T-graft or shield graft. This is very useful. I will abandon the cuttings rooting for citrus and try seeds. You saved me alot of time. Thank you for your concise and easily understandable instructions. Can trees like apple, pear and asain pear be propagated this way? I know they are often propagated by grafting onto rootstock. Will fruit trees grow through propagation of hardwood cuttings? What are the advantages of using this method? The other issue is that any variety of fruit tree, wherever it is in the world, let’s take a Granny Smith apple for example, originally came from a single tree in one part of the world, in this case it was from a seedling that came up by chance from a pile of discarded crab apples in Australia in 1868 and was discovered by Maria Ann Smith, who propagated the cultivar. In each part of the world where a Granny Smith apple is grown, it will be grafted onto a different rootstock to cope with the different soil types and soil conditions, root diseases and numerous other factors. Also by using different rootstock to graft onto, you can decide how big the tree will grow, from dwarf to full-size and everything in-between. So, in conclusion, it’s always better to graft apples and pears! Thank you for sharing your insights with me regarding growing apples and pears from cuttings. I am wondering if you would be kind enough to tell me if it is advisable to graft a desirable grape variety onto wild grapevines? If so, what method and timing is most advantageous? Can matured laurel (bay leaf plant) plants be propagated by cuttings? If possible, what could be the best method? What is the usual method for propagating this plant? Hello, Can I Take hardwood cuttings in mid summer and store them in a fridge up until the next spring, to be planted. Will they still be able to potentially strike? No, because hardwood cuttings are dormant in winter, which is when you would cut and store them. Since they are actively growing in summer and still have leaves, they would not want to go dormant, you would be messing up their natural cycle. The chances of keeping them in the fridge for part of summer, all of autumn and all of winter, which is over half a year, and keeping them alive is unlikely, they are living and need to draw their energy from somewhere to stay alive that long! I was playing around with some grape vine cuttings and planted them probably a month and a half ago.I put some on a greenhouse a neighbor has and some in my basement on a garden heat pad set at 80. Of the ones in the greenhouse probably 30 of the 50 I planted the buds have swollen and some have actually started leafing out. I won’t be able to plant them her until at least the middle of May. Should I put them in a cooler place to slow them down or just keep letting them grow? I am really eager to try make some cuttings of Teak, Tectona Grandis, and have lots of parent trees to work with. Are there any tricks that I should be aware of with this species or can I follow the steps? That should definitely give you some sound guidelines for propagating teak trees. i have a heated bench setup in one of my tunnels and i have planted raspberries and blackberries for propagation, i am interested in taking hardwood cuttings now, i know it is late but it will buy me a year, the buds have not burst yet, i was hoping to do 2 bud cuttings and i will be doing 1000 or so, from what i have read they won’t root better than 40%, does that sound about right? next season what is my best option for propagating a large number of plants from each mother plant? if a raspberry plant had crown gall would it be safe to take cuttings from it? Hi Stephen, you mention “I am interested in taking hardwood cuttings now” – I need more information, your ‘now’ in one part of the world may be the opposite season of someone else’s ‘now’ on the other side of the planet! What season are you in specifically? I am also interested in hardwood cuttings. I try to grow them for bonsai purposes. I’m researching methods of building a cheap homemade heating pad. Would you happen to have any experience or advice as to how I should go about doing this. I though of LED rope lights or an electric blanket; what other ideas do you have?.Thanks. Hi Joe, proper horticultural propagation heating pads and strips are not that expensive unless you buy the fancy temperature regulated varieties which will hold the cutting medium at an exact temperature, but they are worth the money. As a person with qualifications in electronics as well (yeah, I’ve done a lot of things in my life!) I would strongly advise against the two suggestions you make for cheap heaters as LEDs are low current devices that are designed to emit lots of light but very little heat, and electric blankets are not designed to be anywhere near damp or moist areas and present a serious electrocution hazard! In the seed raising article (https://deepgreenpermaculture.com/diy-instructions/starting-annual-vegetable-seedlings-indoors/) I suggest placing the seed trays on top of the refrigerator in late winter to raise warm season seedlings early, an indoor hot water unit will work too, to provide warmth. That would be a cheaper and safer option. Hi, will first year hardwood cuttings propagate if cut in the spring (I know winter is preferred) or is it a dead loss? I doubt, as the leaves would already be out, less energy would be stored in the cuttings, and you will need to maintain humidity levels to keep the cuttings alive and prevent moisture loss through the leaves – otherwise it would be a common technique… Sounds like doing herbaceous cuttings with the wrong cutting materials (see https://deepgreenpermaculture.com/diy-instructions/propagating-herbaceous-plants-from-cuttings/) Some plants grow from cuttings easier than others, you’re always able to try it out and see what happens though. I haven’t done it yet, was thinking about trying a bunch of different cuttings (Hard, soft and in between) now before any leaves show up and wondering if I’ll have any success. I would trim off any leaf buds to make sure the cuttings don’t spend any energy on leafing. Can I use this method to take cutting from a Tulip tree? It us now April 19. Is it too late to try for this season? The buds are just starting to become visible. Thank you! Tulip tree (Liriodendron tulipifera) is usually propagated from seed or by grafting. Propagation using cuttings is said to be difficult, and if you choose to try growing from cuttings, use semi-hardwood cuttings taken in mid-summer to early autumn, use current seasons growth that is starting to become woody at the base. I’ll have to write an article on propagating semi-hardwood cuttings soon! I always had a problem with fungus and dead stick when I tried to clone tree from cuttings. You shouldn’t have any problems if you follow these instructions. Sounds like your propagating medium is far too wet. Dear Angelo, I found out too late that I tried rooting a fig cutting at the wrong end using water culture. Instead of the base, the tip is immersed in water. The 2 nodes have sprouted and the shoots are growing well. No fungal infection 11 days later. What do I do from here? The base which is sticking out of the cup is already exposed to air. You can recut the base, and insert the cutting the right way up in a suitable propagation medium (not water for figs! ), but since the leaves are beginning to open you will need to use some form of plastic cover to hold the humidity in – see my article “Propagating Herbaceous Plants from Cuttings” for a detailed description. Angelo, I’d like to try and propagate some river birch trees via cuttings, can this be done? Any specifics tricks? Hi what the best way to propagate flowering plum tree.I try layering but not getting much luck. HI ANGELO … do you also field horticultural questions? What I would like to know (as our informant at this site appears to be very well informed in such areas) is when planting hardwood / softwood cuttings or the seeds of fruit from fruit trees (apple, any of the citrus, etc), is the resultant fruit true to species, or does it produce an inferior ‘sport’ or ‘a deviation from the true’? YouTube is full of steps on ‘how to’ with respect to fruit trees, but we only get to see the resultant plant over about 2 years. Hi Daz, thanks for your question. Most fruit trees do not grow true to seed, each seed will produce a tree and fruit that will come out different, that’s how trees ensure genetic variation for maximizing their chances of the survival of the next generation. Now you know why deciduous fruit trees are grafted, only by grafting the scion wood from the original tree can you ensure that you get the same fruit each time – so yes, Granny Smith apples for example, worldwide, have all been propagated from the same single tree, quite amazing when you think about it! Mediterranean fruit trees such as figs, pomegranates and mulberries and grapes can all be grown from hardwood cuttings and they produce genetic clones, no need for seedling grown trees or grafting. Citrus is grafted to specific rootstock such as flying dragon to create dwarf citrus trees or trifoliata to grow fill size trees that will be suitavle for specific soils. Most citrus are true to seed because they are in fact polyembryonic, the seeds contain more than one plant embryo, one only embryo is the product of fertilization and the rest are genetic clones of the parent tree. When these seeds are grown they produce multiple shoots, the fertilised one is usually the weakest and is removed. The following citrus are monoembryonic and don’t grow true to seed – Clementine Mandarin, Meyer Lemon, Nagami Kumquat, Marumi Kumquat, Pummelo, Temple Tangor, Trifoliate orange (also known as Citrus trifoliata, Poncirus trifoliata, Japanese bitter-orange, or Chinese bitter orange). What are my scion options for grafting japanase maple bud grafts, or any tree or plant will do? Is Japanese maple easily propagated through cuttings and what about the beautiful australian maple and canadian maples. Thank you. Great blog for all horticulture enthusiast . May I know where to get tree cuttings of Pomegranate which is a great cultivar for commercial planting? Does it need to apply for phytosanitary certificate from exporting countries? Thanks! The pomegranate variety “Wonderful” is a popular variety that is used commercially in the US. It’s a popular variety, so you shouldn’t need cuttings, you should be able to buy trees in many countries. of which can bear fruit within a short period of time. Yes “Wonderful” is popular variety so far. But from my research done. Tunisia soft seed is getting much popular now. Can you enlighten me the market trend now on Pomegranate? Hi sir, great reading those above comments.^^ Im a student at VSU and I want to propagate a Pterocarpus indicus (narra) which is a native spicies in the Philippines would it be possible to grow by cutting? also sir, can you give me published article about this propagation? “P. indicus may be propagated by seed, which germinate in 8-100 days, but the initial growth of seedlings and saplings is relatively slow. ..would it be very possible to clone deciduous tree species sir and what would will be the best tree specie to propagate? would it be possible to clone mangrove specie sir? Hi Eric, I explain a lot about what you’re asking, propagating deciduous fruit trees, in my article “The Difference Between Seedling, Grafted and Cutting Grown Fruit Trees“. Apologies, I’m not familiar with mangrove species, the nearest ones are hundreds of kilometres from where I live, so I can’t help there. Have grape cuttings that I would like to root. Have been advised to use perlite and peat moss. Should I add water to the perlite/peat moss mixture before inserting the grape cuttings? Or water after planting? The perlite/peat moss mixture will work for grape cuttings, as will straight coconut coir, or just well-draining potting mix. You can water your propagation mix first, so it’s nice and moist, then put the cuttings in. How would I do this with a pine tree? There are many plants that can grow from root cuttings, such as comfrey and horseradish, but gooseberries can only be propagated from stem cuttings. What happens to cutting that was taken from dwarf rootstock, will it becomes a full size tree? All grafted trees, whether dwarf or full sized, are grafted from cuttings (scion wood) taken from one original tree, and grafted to different rootstocks all around the world. So all Granny Smith apples for example all came from one original tree, and all cuttings taken from all other Granny Smith apple trees are clones of that one original tree! All scion wood on all grafted trees is a genetic clones of one particular variety and is always the same, regardless of what rootstock it’s grafted onto! If you take a cutting from a granny smith grafted onto dwarf rootstock, and graft it onto a full size rootstock, you’ll produce a full size tree. The scion wood on the top has nothing to do genetically with the rootstock. Thank you so much for sharing your knowledge & experience. Propagating is my new passion, now that my 4 kids have grown, I need something to nurture, especially through the long winter months in Illinois 😉 I’ve made several hardwood cuttings of several different species, mostly trees. I’ve planted them in planting medium in a large fish aquarium. Some of these will probably be a total fail, but this is my first try. Do these cutting needs to be in the cold for a certain period of time before they will root or can I just keep them inside? If they need to be cold, how cold and for how long? I assume the deciduous tree propagation technique works well on ornamental trees (Acer rubrum & palmatum, Cercis canadensis var., Cornus florida & chinensis, etc..) and on longer whips ? Please advise per your experience….. Additionally, do you have any experience propagating Conifers such as Cedrus & Bald Cypress species from cuttings ? We own and run a medium sized retail nursery in Sacramento, CA area. We specialize in smart useful plants and we grow 80% of what we sell because the grower market services mostly an impulse buy market. We successfully propagate our own shrubs and perennials it 2-2500sqft Smart Greenhouses, but have not been successful at trees and conifers mentioned. Would really appreciate and be grateful for any advise. Your article here is very well done ! It is a great service to others (Professionals & DYI-ers)…Thankyou , Dave Bushnell, Bushnell Gardens Nursery. Hi Dave, thanks for your comment. I haven’t tried propagating any of these trees, many cultivated ornamental trees are often grafted, though it’s different for every kind of tree. You’ll have to investigate each particular species, case by case, to see which performs best with which specific propagation technique. I believe many conifers are cutting grown though they’re slow to grow. Sound like you have a wonderful business going there, nice to see a retail nursery that grows their own plants! Hi Tom, when I prune my grape vines, if I intend to use the cuttings I place the bottom end in a bucket with a few centimetres of water so the cut ends do not dry out. How long prunings take to dry out before they can be used for propagation is highly variable and depends on wind, sun, humidity and many other factors. People often forget that cold, dry winter winds can strip moisture from plants quite well in certain climates. If the grape vine cuttings have been left out for a week, I would select the thickest ones as they would retain the most moisture, and I would cut off the bottom portion as this part would most likely have dried out, then propagate as you normally would a hardwood cutting. Please let us know if it works! Well, there had been both snow and some rain. Once I mage my cuttings I soak them in water for at least 12 hours before burying them upside down until I’m ready to put them in nursery rows. Very helpful thank you! I had a question about doing my cuttings indoors during the winter. Is it necessary for them to have a light source? And if so can I use grow lights? You can’t propagate deciduous hardwood cuttings in winter because they’re dormant, and they have no leaves so there is no need for light. If you’re referring to plants that are evergreens, that don’t lose their leaves, yes, some can be propagated under grow lights, and they do even better when you place a propagating heat mat underneath to warm the soil medium to stimulate root growth. This article is amazing,THANK YOU for not only citing reliable sources but continuing to do so for YEARS following up on comments! Incredible! We’ve had some crazy weather here in New England, warm spurts that have encouraged budding and now, back to back blizzards! There’s been a LOT of downed branches, many perfectly healthy bystanders crushed by larger limbs. Can hardwood cuttings be successfully propagated from such casualties, their lives cut short so close to spring? Any suggestions regarding temperatures, choosing and cutting the best candidates (lots to choose from!) or other considerations would be greatly appreciated. Species include sugar maple, lilac, crabapple, mulberry, concord grape, forsythia, Japanese maple, rhodedendron… This list goes on! Particularly interested in the lilac, but I’ve read they are especially difficult to root from cutting? The deciduous trees are worth trying to propagate in winter as they’re dormant, anything evergreens won’t strike unless they’re actively growing, which means warm spring weather. I recenlty had a pagoda dogwood come down due to an ice storm. Wondering if I can propigate cuttings in the spring? If so, any suggestions on how to get the best results. Thanks! This has been a great thread! Hi Eric, since the tree will be in leaf rather than dormant, you could try propagating semi-hard or green cuttings. See the companion article Propagating Herbaceous Plants from Cuttings on how to do this. Please let us know if it works! How About Sea Grape? Heard it’s possible, but I’d like to plant a bigger branch like 3 inch diameter and 4 feet tall with 3 or 4 buds.. Also, I think I might get in trouble in that I want to plant it in city property. Long story, but the city cut down some big Oak trees because they wanted to move the garbage bin for a large retailer. There is a large open space the size of foot ball field behind my townhouse and from the second floor I now have a terrible view of garbage now that the trees are missing. I called the city and they said they needed to see if they had available funds in the tree fund… then 2 days later a storm hit and I think at least 25% of trees everywhere were down. Side question, but do wonder what the crime and penalty for planting trees in public property is?? I won’t hire lawyer and just imagine me in front of judge defending my actions. What happens if you do not cut off the growing tip at the top? Is that necessary? The soft growing tips wilt and lose a lot of moisture, causing the cutting to dry out. Asimina triloba (north american pawpaw) is considered impossible, or next to impossible, to propagate by cuttings as it multiplies by seed and clonal suckers. What would you recommend to try on pawpaw cuttings? Can I propagate Box Elder Sensation from cuttings and if so, how? Sensation Box Elder (Acer negundo ‘Sensation’) can be propagated from cuttings, take softwood cuttings when it’s actively growing and in leaf during the warm seasons. Use rooting hormone and maintain the humidity around the cuttings as the roots apparently take several months to form! Commercially, the humidity is maintained using a misting propagator, but you can place the cuttings in some form of enclosure and manually mist the cuttings with a spray bottle, but you’d need to do that several times a day, which may not be practical. Once they root, they’re potted up and hardened off gradually they repotted as they grow, and this whole process can take a year or more from the cutting stage to having plants that can be planted in the ground. Are apples trees able to be propagated this way, or only by grafting onto rootstock? How about plums and Asian Pears? Thanks for your help. Asian plums and pears are also grafted.